For gamefowl use (ornamental birds, which are not used as human food), birds need to be at least 3 weeks of age and then a 2nd dose is required 3 to 6 weeks later. Inject 0.5 ml into the breast muscle, only if you can't manage a subcutaneous injection for some reason. Intramuscular injections of this product can cause knots at the injection site, so it's best to inject subcutaneously (under the skin) at the back of the lower neck where you will find the most loose skin on a chicken. Do not stick the needle into the spine or neck muscle. Follow other directions below. 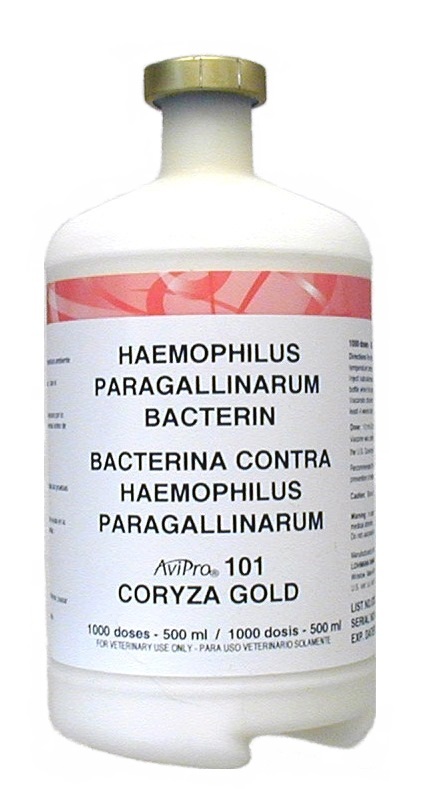 Active Ingredient(s): The infectious coryza bacterin is prepared from concentrated cultures of three antigenic strains of Haemophilus paragallinarum. The vaccine was carefully produced and passed all tests in accordance with the U.S. government requirements. 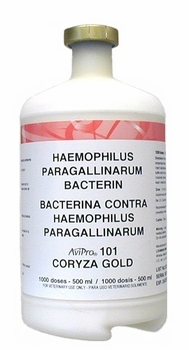 The product is used as an aid in the prevention of infectious coryza due to H. paragallinarum. Dosage and Administration The pullets can be vaccinated when they are three weeks of age or older. Revaccination can be done at least three weeks after first vaccination and at least four weeks prior to onset of lay. Shake for two (2) minutes before use. Preparation of Vaccine: Remove the aluminum overseal, the vaccine is ready to use. Should greater than four (4) hours elapse between the first and last use of the vaccine from any one container, it is recommended that the vaccine be shaken again before continuing with the vaccinations. Dosage: Inject each bird with a 0.5 mL dose subcutaneously or, (and we at Wood Enterprises do not recommend this) intramuscularly in the breast muscle. Precaution(s): Keep the vaccine in the dark between 35-45°F (2-7°C). Do not freeze. Use aseptic precautions. Sterilize needles, syringes and stopper. Vaccinate healthy birds only. Consult a poultry pathologist before vaccinating. Burn the vaccine containers and all unused contents. It is imperative that the user of this product comply with the instructions stated in the direction sheet packed with each product. The vaccine must be prepared and administered as directed to obtain the best results. The use of nonsterile needles under field vaccination may result in abscess formation and condemnation of the birds. 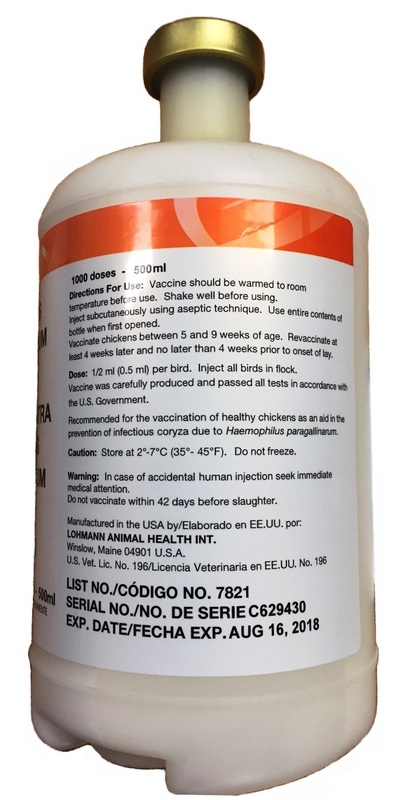 Warning(s): Do not market birds for at least six (6) weeks after vaccinating. Make sure that the birds marketed do not have swellings at the site of vaccine administration since this may result in condemnations of the birds.